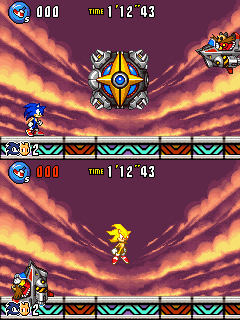 Nonaggression is the true final/extra level in Sonic Advance 3, where the last boss, Ultimate G-merl (アルティメットジーメル Aruteimetto Jīmeru), is faced. You need to earn 7 Chaos Emeralds and beat Altar Emerald with Sonic as the leader to access this zone. After beating the Altar Emerald boss as Sonic, Eggman & G-merl will retreat. Following after them, G-merl stops for a moment before turning around & tackling the heroic hedgehog; effectively stealing the Chaos Emeralds from him. G-merl then uses the emeralds to transform into a sort of "Perfect" state, and betrays Eggman by using one of his extending claws to grab his Egg Mobile & slam him into Sonic. Leaving the emeralds behind, "Ultimate G-merl" then leaves to cause more havoc elsewhere. Sonic, knowing what must be done, quickly powers up into Super Sonic using the discarded Chaos Emeralds, and flies off to stop the mechanical monster, with Eggman following close behind after a moment of hesitation. When you enter the stage, Eggman will be Super Sonic's partner. 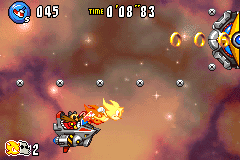 Like every game since Sonic Adventure, this level is played only as Super Sonic, though Eggman will be used to attack. Sonic & Eggman only have one Tag Action move: holding and charging Eggman up to ram into Ultimate G-merl, opening up a red orb in the front, allowing Sonic to dash forwards and ram it. The longer you hold , the longer Ultimate G-merl's "mouth" will stay open after being attacked for Sonic to hit. The maximum charge is signified by an orange aura. All attacks can be avoided by, as said above, using Super Sonic's dash. Ultimate G-merl is vulnerable at all times as long as you can nail his "mouth" with Eggman and then dash attack the red orb that appears. After 12 hits, Ultimate G-merl will be defeated. The music that plays in this zone is a remix of E-121 Phi's battle theme and the Colosseum theme from Sonic Battle.